Today’s article is all about an unusual discovery, a galaxy that appears to be lost in time and space. That’s exactly what’s happened here. Eleven billion years ago, light from the newly-discovered, distant galaxy began its long journey towards us. 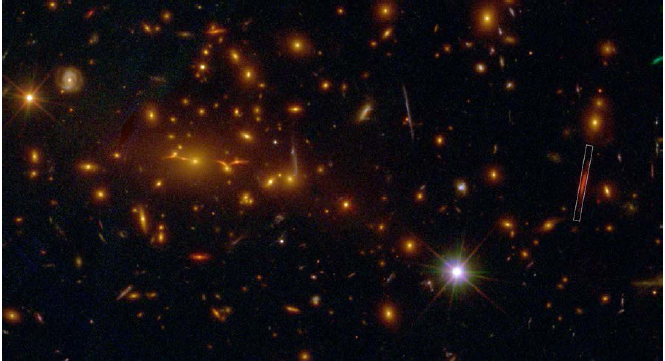 A little under six billion years ago, the galaxy’s light passed close to a massive cluster of galaxies and in the process was redirected towards its final rendezvous with our telescopes. The new galaxy doesn’t even have its own name yet, for now being known only as ‘MACS 2129-1’ by association with the cluster that aided its discovery (which was part of the Massive Clusters Survey – MACS for short) – as seen in figure 1. Figure 1. There it is – on the right hand side, highlighted by a rectangle. Pretty non-descript looking, huh? On the left is the massive cluster of galaxies whose gravity has stretched and magnified the target galaxy. Figure 1 from the ‘Extended data’ section of the paper. 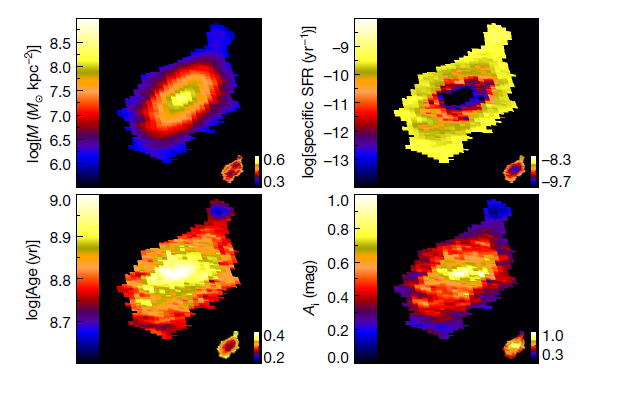 Using multi-wavelength imaging from the Hubble Space Telescope, the authors are able to work out some key properties of MACS 2129-1, which are mapped out in figure 2. The key points are that the galaxy is pretty massive, is not forming new stars, and the stars appear to be around a billion years old. Our new friend is an example of a ‘post-starburst galaxy‘, in which an intense bout of star formation has ceased within the last billion years or so. So far, so good: the galaxy has formed rather a lot of stars, isn’t forming any more, and at the point we’re viewing it, the universe is only a few billion years old. Figure 2 – key findings. From top left, clockwise: (1) stellar mass density (brighter bits mean ‘more stars’). (2) star formation rate per star already formed (the main thing here is actually that it’s very low everywhere, though lowest in the middle). (3) dust extinction (brighter means more dust). (4) age of stars (the dark bit is a relatively young clump of stars apparently falling towards the main galaxy). Figure 3 from the paper. So, what’s interesting about MACS 2129-1? Well, there are a few different ways to make galaxies. The best understanding we have of galaxy formation tells us that you can easily make a galaxy as massive as our new friend even in a short period of time – but you need a really violent, disruptive formation process to do so. More to the point, you ought to end up with a highly compact ‘red nugget’, a dense blob of stars which isn’t rotating particularly fast and in which star formation has been shut off. After star formation ceases, a galaxy becomes progressively redder as its blue giant stars quickly expend their fuel and die off, leaving behind less massive, redder stars. That’s all very well, but MACS 2129-1 refuses to play ball. 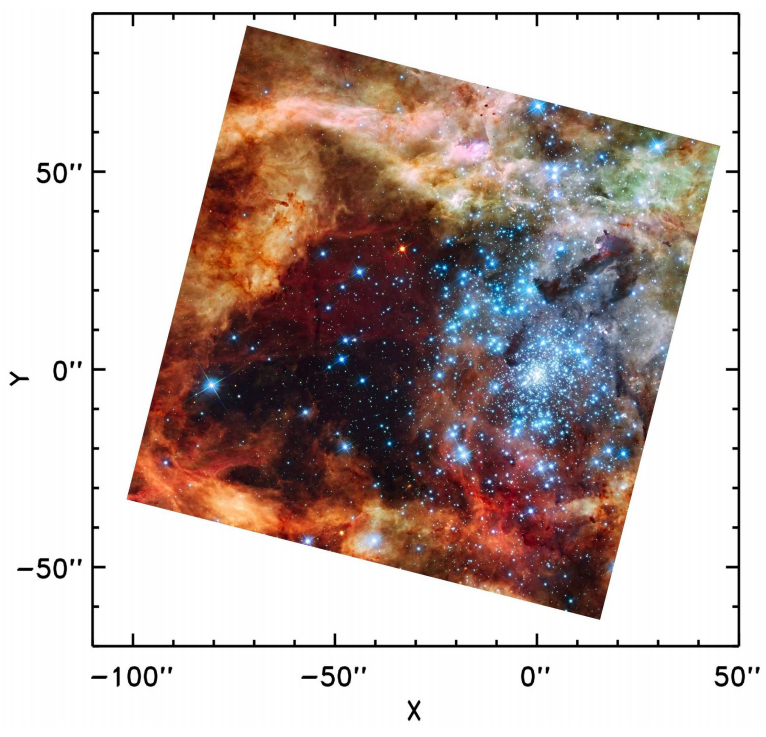 It’s massive, yes, and star formation has been shut off, yes, but it doesn’t look at all nugget-like. 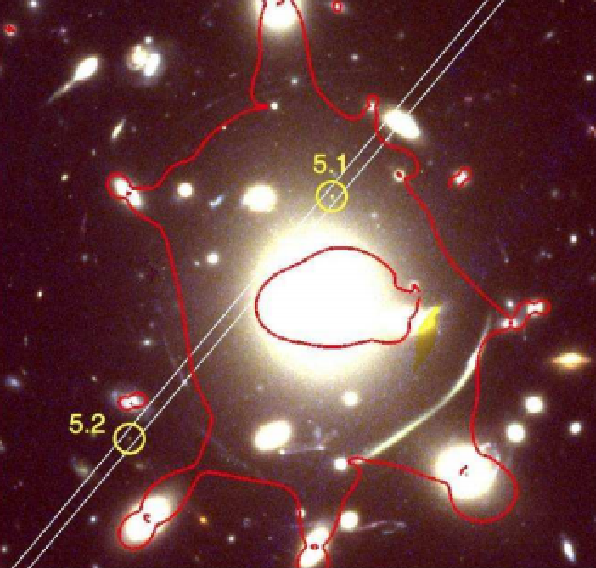 On the contrary – thanks to magnification by the gravitational lens, it can be seen that it’s a fast-spinning disc galaxy. That kind of galaxy is far from rare later in the life of the universe (if you’ll forgive another plug for a previous article, see here), but it’s a bit of a puzzle as to how this one ended up forming so early, in the first few billion years available. So what’s going on? The authors present a scenario, perhaps a relatively rare occurrence, in which this galaxy could have formed. In the early universe, the gravity of a blob of dark matter could have drawn in vast streams of gas. These streams would then collide with each other, causing the gas to shock (this is the same effect that causes a sonic boom when an aeroplane breaks the sound barrier). Shocked gas can rapidly radiate away energy – and so the gas can cool down and condense into stars. Much like water spiralling down a plug-hole, the streams of gas are whipped into a disc and many stars form quickly. The final piece of the puzzle is then how to switch this process off and stop forming stars! The authors suggest that at this point, feedback from the galaxy’s central supermassive black hole can kick in, heating the gas temperature and preventing it from condensing further. This causes star formation to cease as the gas can no longer collapse to form new stars. So, mystery solved? Well, that depends. Time – and more data – will tell whether the proposed scenario is viable or not. Nonetheless, this intriguing discovery clearly has a lot to tell us about the physics of galaxy formation.